This blog was contributed by our customer friends at Spark Ventures. It was written by Peter Yates (@peteyatesnz) who is the head of operations and platform delivery. When IT does not break, it’s all good but when things go wrong it’s all hands to the pump. IT should not just be about keeping the lights on anymore, whereas that may have been a strategy in the past it certainly will not be good enough in this Digital era. Organizations may require IT to guide them through periods of significant change or lead Digital strategies and innovation. IT must therefore be an enabler and leader of change and must ensure it can respond to the current and future needs of the organization by being flexible and agile. So how can IT achieve this? If IT cannot get to grips with this approach then we may see a proliferation of shadow IT or IT being bypassed by the organization in favor of advice from outside influences that can help the Organization consistently respond to and meet its business objectives. What does IT stand for and how will it support organizational goals? How will it use the cloud and automation? How can IT support the Organization’s need to be more Digital, in a world where the need to be Digital or die is so prevalent? As Forbes (Cloud is the foundation for Digital Transformation, 2014) has recognized "Since 2000, 52 per cent of companies in the Fortune 500 have either gone bankrupt, been acquired or ceased to exist". The reason for this, in my view, is because Organizations have failed to keep up with the constant rate of change. What does IT see as its core business? Where will it add the most value to the organization? By having this clearly defined within IT strategy as part of supporting a wider organizational strategy the answers to these questions will help clarify the most suitable technology solutions, in essence creating some guiding principles for making architectural or technology decisions. For example, an internal IT team within an innovation venture (as part of a leading telecommunications company) may decide that managing an email service is not a core service because there are cloud solutions such as Office 365 or Gmail that can be consumed without the operational overhead of a traditional email service. Ensuring the IT basics are done correctly (e.g. monitoring, network and application stability/availability) are the building blocks for creating credibility and stability. Without this in place an Organization may, for example, have the best apps on the market but which are constantly unavailable and unusable by the Organization and its customers. Poor foundations means that supporting organizational growth will be hard for an IT team to achieve. Getting the foundations rights needs to be done in conjunction with setting a clear strategy and being focused on what is core to IT and ultimately the organization. If you can’t deliver on projects, service levels or advice in general then you risk losing the trust of the Organization and, more than likely, IT and the CIO/CDO will be overlooked for their advice to the executive team. If you cannot consistently and quickly deliver to the needs of the Organization then you may see a proliferation of shadow IT within the company, again a possible sign that IT is not being agile or responsive enough to meet the needs of the organization. Above all get the basics right so IT can build on solid technology decisions and solutions that support the Organization and its strategies (growth or otherwise). 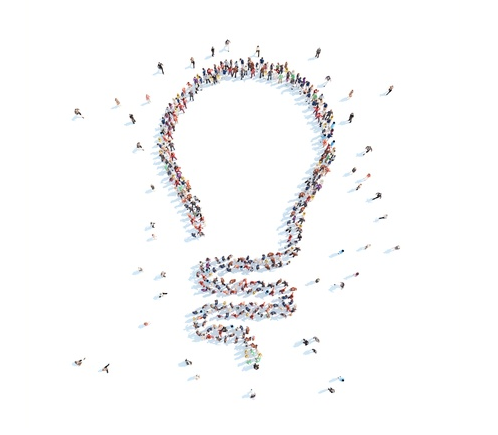 If IT can't deliver in its current guise, it must look at ways to enable this, such as creating a separate innovation team that is not constrained by legacy, as has been shown by Spark New Zealand (Spark Ventures), New Zealand Post, Fletcher Building or Air New Zealand. Read more: CIO Upfront: Is there such a thing as bad innovation? It is vital that IT stays up to date with industry and technology trends (Cloud, IoT, Digital, SaaS) and can demonstrate, or at least has a view on, how these can be utilized by the organization both now and in the future. Being relevant and current reduces an organization's need to look elsewhere for advice and technology solutions. Staying current could also mean a review of how IT is structured, a CIO versus a CDO or a less siloed approach to team structure. Digital is not one particular “thing” - it’s also a change in mind-set and a move away from the traditional to being more about an organisation’s combined use of social media and analytics to drive decisions, particularly around its customer’s. Being “Digital” is also about an organisations use of the "cloud" (SaaS, AWS or Azure) and having a mobile presence for its products, services and support. The strategies and subsequent use of social media, analytics, mobility and cloud by any organisation must coexist. For example, it is not useful to just have a mobility strategy without the customer analytics behind it, or the ability for an Organisation’s customers to tweet or comment using the Organisation’s application using any device. If IT focuses on the above five key areas it can remain relevant as well as being an enabler to an organisation in achieving its goals and strategies alongside (rather than having to go around) IT. In this Digital era it’s not only consumers that consume - organisations are looking at options within this "consumption economy" as a way of focusing on core business and consuming the rest. Some great examples of this are Salesforce (CRM), Zuora (Billing), Remedyforce (Digital Enterprise Management), Box (document storage), Sumologic (Data Analytics) or Office 365 and Gmail (Collaboration). 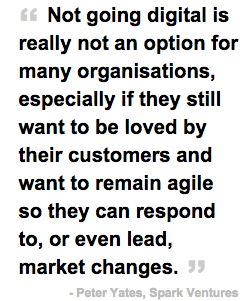 Not going digital is really not an option for many organisations, especially if they still want to be loved by their customers and want to remain agile so they can respond to, or even lead, market changes. Peter Yates (@peteyatesnz) is head of operations and platform delivery at Spark Ventures (formerly Telecom Digital Ventures). His previous roles included technology services group manager/CIO at Foster Moore and IS infrastructure manager at Auckland Council.